I am a big fan of Shaq the basketball player, Shaq the personality, and Shaq the philosopher. I am less a fan of Shaq as the fourth member of the TNT studio crew. It's not that Shaq has done a particularly poor job. My concern is that his dominating personality interferes with the legendary chemistry that Ernie Johnson, Kenny Smith and Charles Barkley shared for so many years. 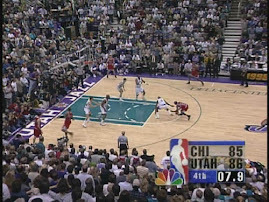 However, one welcome collateral effect of Shaq's arrival in the studio has been forcing Chris Webber -- a frequent guest on the TNT studio crew in years past -- to slide down to courtside to provide gametime colour commentary. C-Webb has thrived in this role. Although a relative novice, he may be the best colour commentator on the national broadcasts. He is articulate, charming, humorous, and most importantly, he provides REAL analysis. Many of the other colour commentators (e.g., Hubie Brown) merely recite cliches, read off the stat sheets provided to them by the producers, and/or describe what has just happened on the floor (a redundancy if you have been either watching the game or listening to the play-by-play announcer). C-Webb actually provides real insight into teams' strategies and as to what players and coaches might be thinking at a given moment. His unique ability in this role may be partly due to being a recently retired player himself. Or it may be due to the fact that he actually respects the intelligence of the fans watching the game. ESPN's suite of color commentators, including J. Van Gundy, Hubie Brown, and the underrated Doris Burke (who provides excellent analysis notwithstanding her lack of pro hoops experience) does a good job. Webber is very good on Turner, though sometimes I find his brain is working a bit faster than his mouth can move and he is trying to tell us too much in one breath. Mike Fratello is also good, though a bit mirthless. TNT's main analysts, Reggie Miller and Steve Kerr, are below average.